Due to Victorian Government legislation amendments to the Working With Children Check Act of 2005 in Victoria coming into effect on 1 August 2017, it is now a requirement for all Victorian-based volunteer Race Officials at the Australian Motorcycle Grand Prix to obtain a Working With Children Check. For those who already hold a valid Working With Children Check issued in the state of Victoria, please fill our the form below. How do I apply for a Working With Children Check? 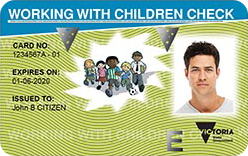 For those that do not currently hold a Victorian Working With Children Check (sample card shown below), as a volunteer, one can be obtained free of charge by clicking here. Once you have received your card please register your information below. If you have any questions, please contact us at motorsport@grandprix.com.au or phone 61 (03) 9258 710.